“A Long Shot”. 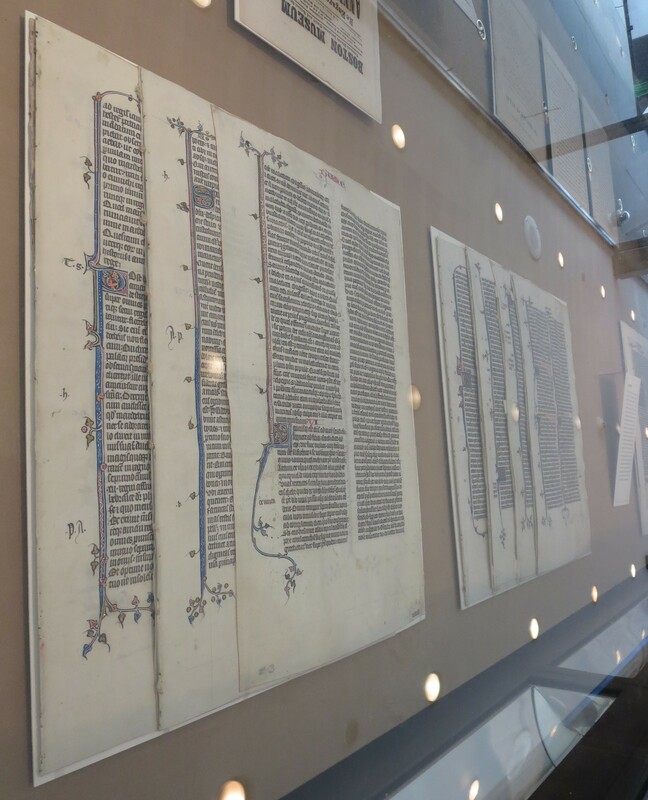 New Acquisitions Exhibition at the Beinecke Rare Book and Manuscript Library in November 2016: View of Some Parts of “Otto Ege Manuscript 14”. 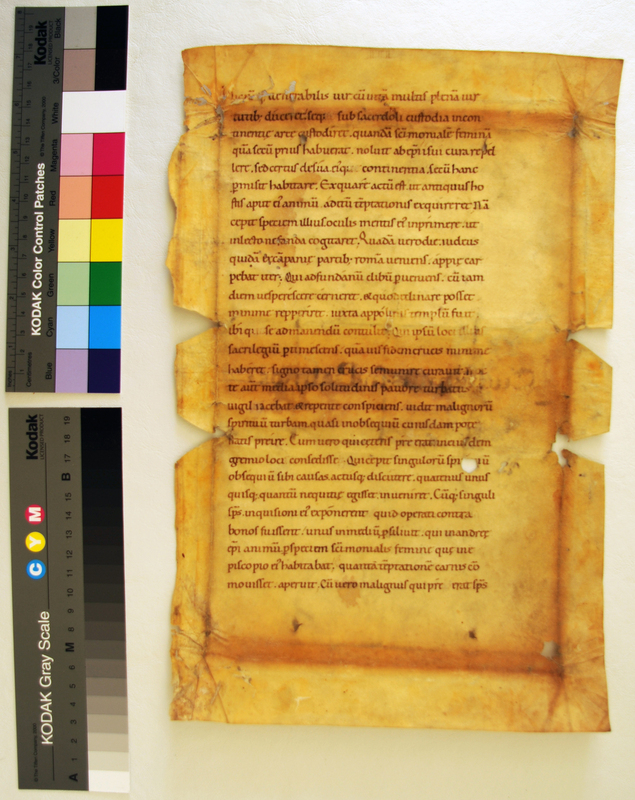 Continuing our series on Manuscript Studies, Mildred Budny (see Her Page) adds new evidence to her earlier reports of some leaves from medieval manuscripts dispersed by Otto F. Ege (1888–1951). Revisions are now in order. 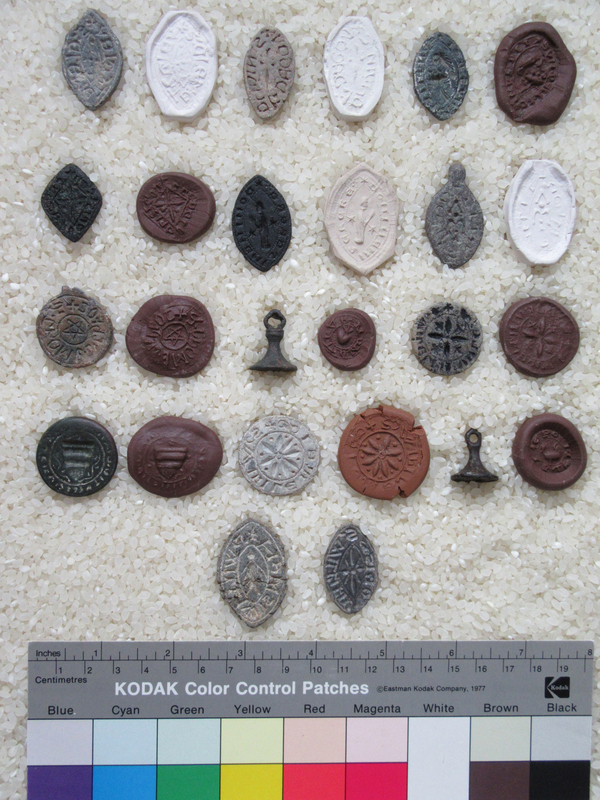 As we continue to look at, and for, evidence of the dispersed materials, the old and new evidence shows more. While giving some answers, the observations also raise new questions. Time now for more Updates for Some “Otto Ege Manuscripts”. Zachariah. Courtesy of Flora Lamson Hewlett Library, Graduate Theological Union, Berkeley, CA. 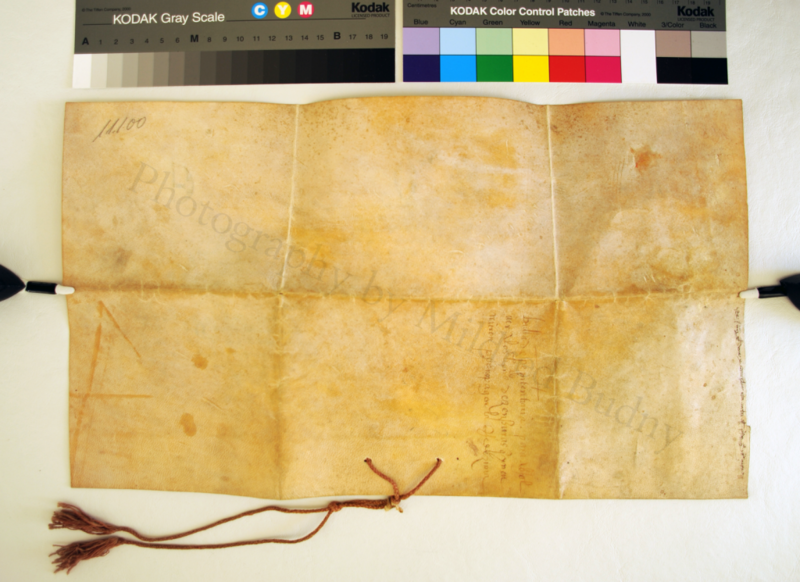 Updating an earlier blogpost reporting A New Leaf from “Otto Ege Manuscript 61” in our series on Manuscript Studies, Mildred Budny (see Her Page) describes further progress in locating and identifying more parts from that little book. It should be said that, after the initial discovery and draft write-up, in the excitement of new discoveries, some long illnesses and a wrenching death in the family, with some gratuitous onslaughts from so-called family members, made it difficult to return on course. Back again. 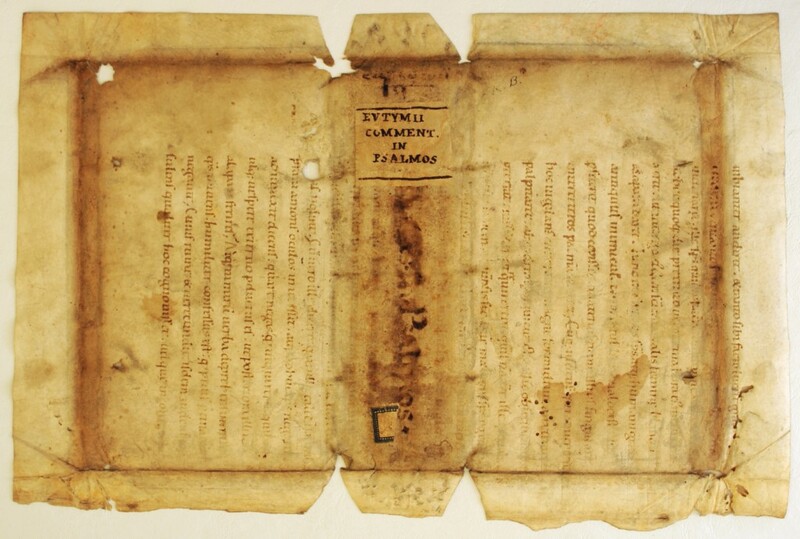 These new discoveries go hand-in-hand with a rapid pace of strides further in continuing research on some other dismembered “Ege Manuscripts”, owned and dispersed by Otto F. Ege (1888–1951), as well as on some other manuscript fragments – which turn out to have unexpectedly interlocking patterns of transmission by 20th-century sellers. 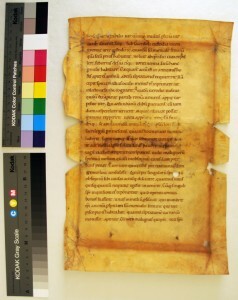 The advances are described in Updates for Some ‘Otto Ege Manuscripts’. Read On, Dear Reader, Read On. To say that “The Plot Thickens” would take the words right out of our mouth. 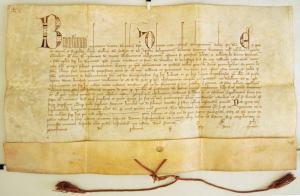 Continuing our series on Manuscript Studies, our Principal Blogger, Mildred Budny (see Her Page) briefly describes a single-sheet vellum document, which lists in French the rents for various plots of land concerning the region of Brie (renowned for, among other things, its distinctive Cheese). Detail of “Brie Champenoise” from the “Atlas Moderne” by Rigbert Bonne (1771). Via Wiki Commons. 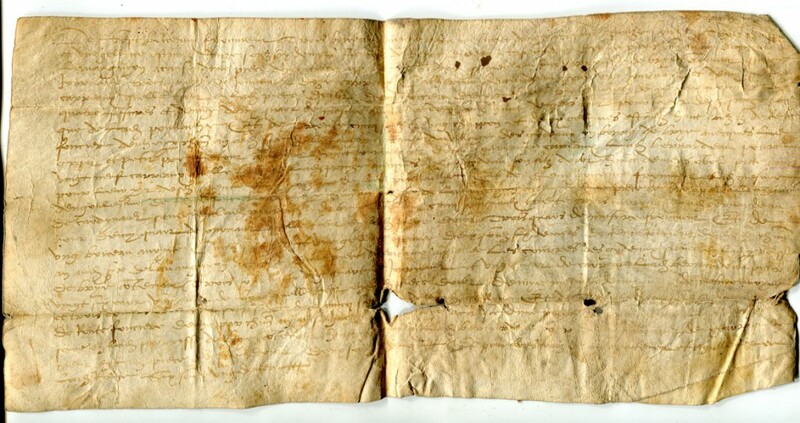 The document in question, now in a private collection, measures at the most circa 298 × 149 mm. The script of the document uses the whitish flesh side of the animal skin. 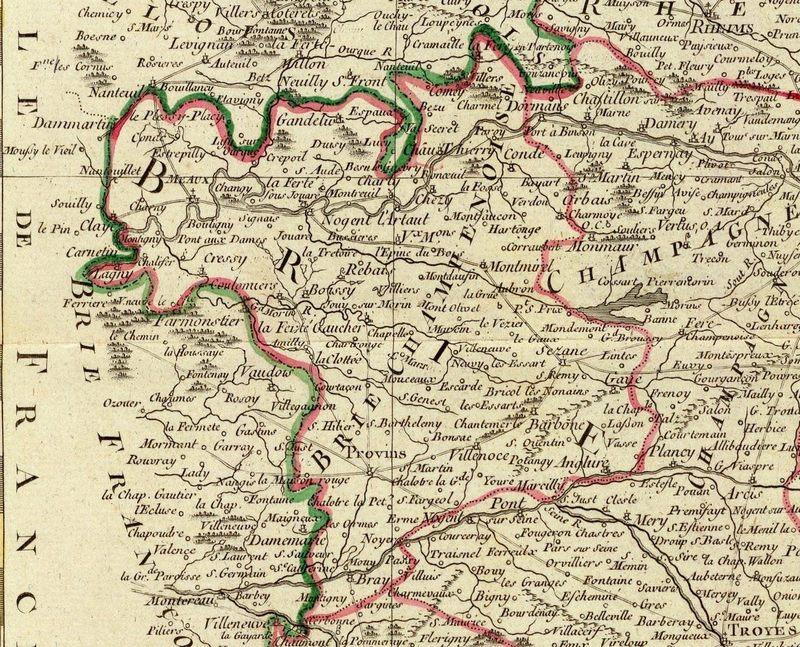 The written side presents a description in French in 22 1/3 long lines of fields and rents from various properties in the area. 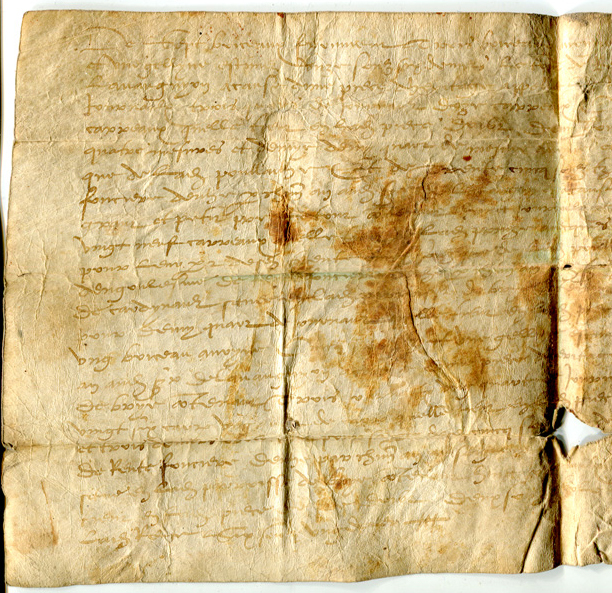 By a single hand, the text is skillfully and swiftly written in faded brown ink. The lines are not uniformly horizontal. 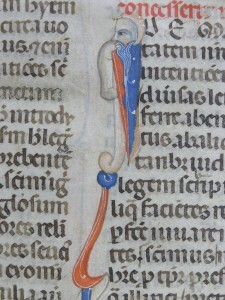 They stand upon an unevenly trimmed sheet, whose contours perhaps conform partly to the shape of the sheet as it emanated from the initial preparation of the writing material. 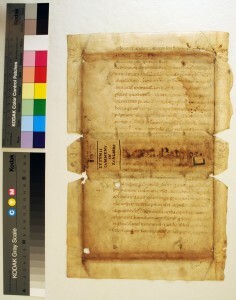 The dorse (not shown here; no image is yet available) is mostly blank, although apparently black light reveals some scarcely decipherable traces of script which has been rubbed or effaced. 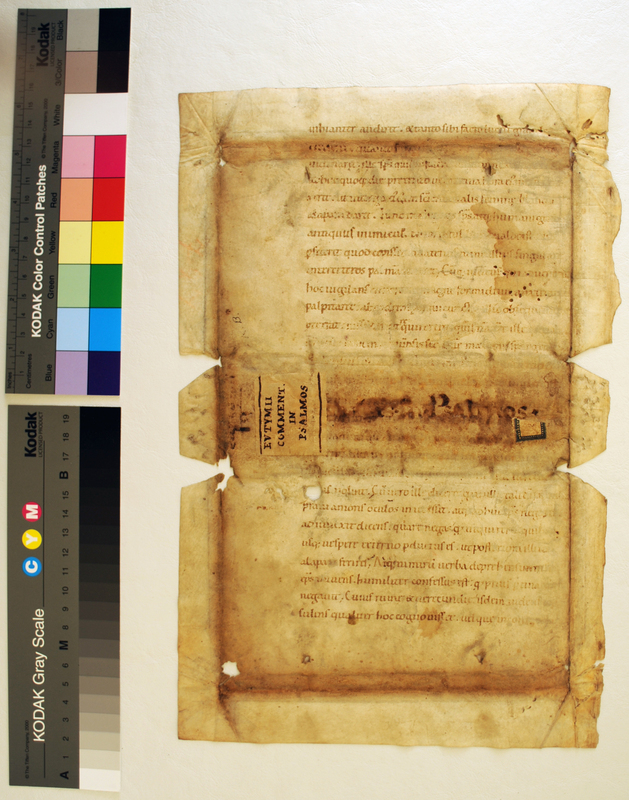 To quote the collector’s report: the document “has nothing obvious written on the verso, although a black light shows what may possibly be faint text that has rubbed out. The recto text is mostly readable with the black light.” Glad for image enhancement, wherever possible. The document is undated. A sensible assessment of its probable date of origin must depend, for example, upon the style of its script. 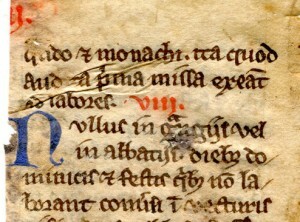 Given points of comparison (in Latin: comparanda), let us suggest that it probably dates from the 153os. 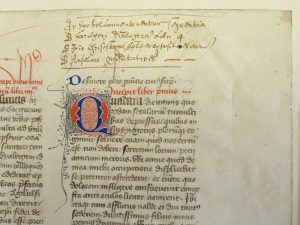 An earlier post in our blog considers 16th-century script by more than one skilled French hands: Scrap of Information. Different hands, stylistic differences, but some similar approaches in both these documents. Plus, the Vienne document contains entries by several different hands. Shared features. Left-hand Half of the Brie Document. Reproduced by permission. Right-hand Half. Reproduced by permission. To put it mildly, much of the vocabulary is more than a bit unfamiliar. Let’s take a sampling, and you might take it from there. For example, one line (guess which one?) reads “. . . Les courres des godeaux situes du ladite paroisse de brye contenans trois journaulx ung quart de journaul et ung quar de carreau ladit bernardeau promo . . .” Presumably the terms ‘carreau’ and ‘journaul’ are land measures. To state that this is “not exactly our field” applies both to the fields in the region of Brie, not possessed by anyone we know, and to our own fields of expertise (so far). Way to go? Bien sur! Do you know, perhaps, of other extant monuments of script from this scribe, from this region at the same point in time, or locations indicated in the span of the document? We would be glad to know more. Piece of Cake? Piece of Cheese? Slice of Brie. Photograph by Coyau via Wikipedia Commons. Over to you. Please let us know your comments. 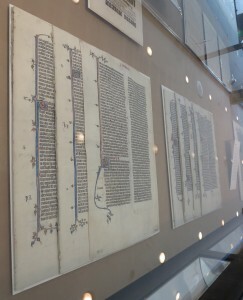 Next stop: More Manuscripts, Of Course. Keep sight of the Contents List for this Blog. 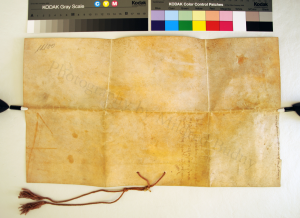 Continuing our series on Manuscript Studies, our Principal Blogger, Mildred Budny (see Her Page) describes a single-sheet vellum Latin document, plus cord, which came within the span of her conservation, photography, and research for the Illustrated Handlist. There, the document holds Number 21. 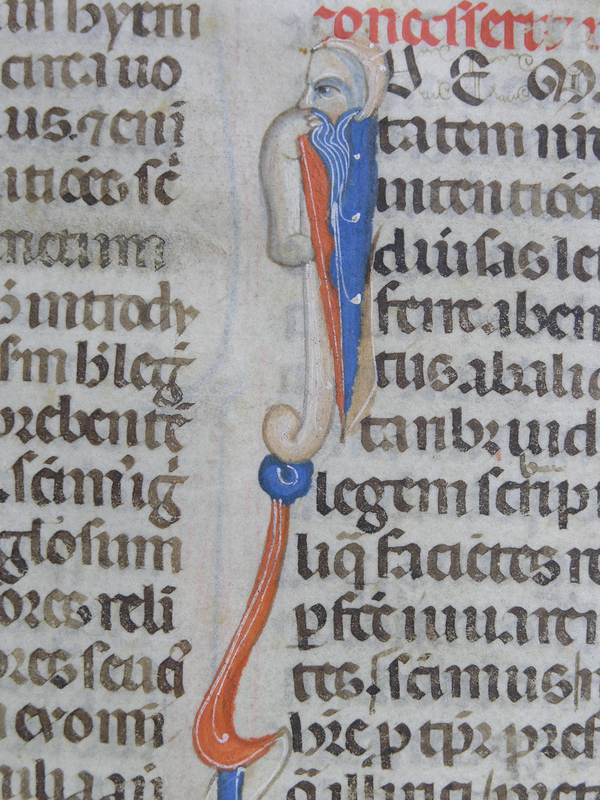 Unlike the other items (so far) in the Illustrated Handlist, this one appears to be a forgery, albeit skilled. In a word: Curious. 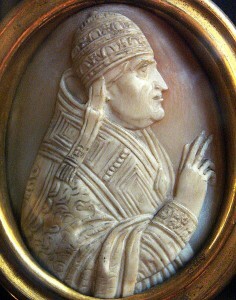 Cameo of Pope John XXII. Photograph via Wikimedia Commons. 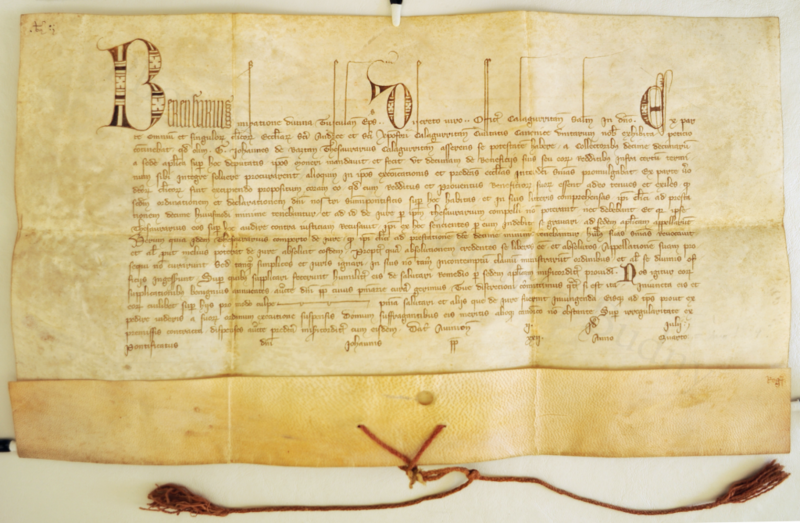 The document was acquired by gift in 1955. The method and appurtenances of presentation provide the name of the donor, Philip Hofer, (1898–1984), his letter announcing and accompanying the gift as a thank-offering, and his custom-made box for the offering. However, it provides no information whatsoever about the provenance, source of acquisition, the presentation provides other useful elements of information which the intermediary would have had. We are stuck with those gaps. Shame. About those lamentable and noxious with-holdings of information in the transmission of materials between modern handlers, some of our blogposts already document the miseries in trying to piece together the traces. See the blog’s Contents List. We are entitled to wonder, also, about the caliber of the gift, which, itself doubtless well-meaning between equals at Harvard with stature and means, carries questionability in its own ‘right’ (or ‘wrong’), considering the dubious nature of the document itself. 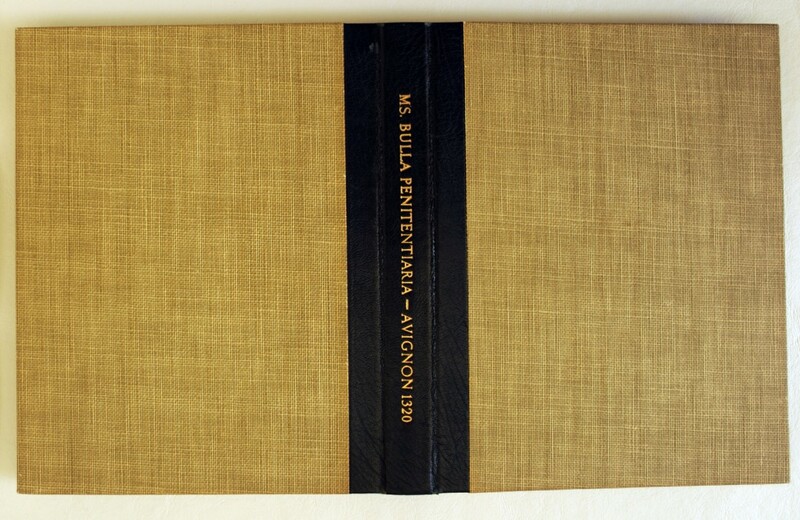 Information about where and how the donor acquired the document is much to be wished. Or what he thought it constituted. 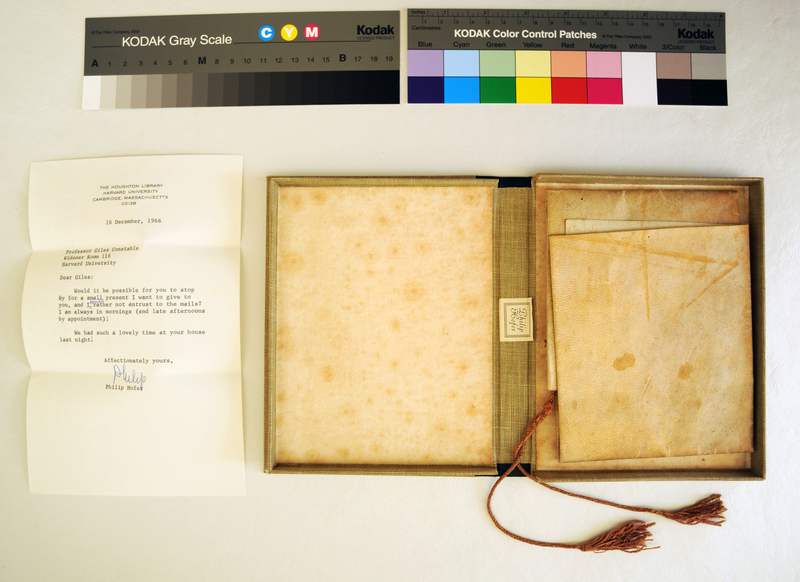 Folded in half horizontally and then in thirds across, along its medieval folds, the document was contained in its custom-made 20th-century lined clam-shell box for presentation to the Owner by Philip Hofer, along with the letter describing that presentation, signed by Hofer and dated 14 December 1955. With that presentation enclosure, I first came to know the shape and features of the object. It took a while before the oddities came pressingly into the forefront. In and Out. All About. 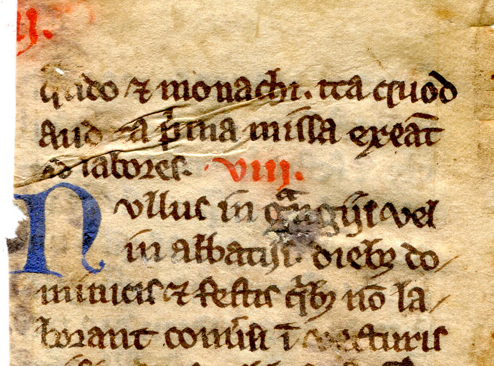 The text of the document begins with an enlarged and decorated ink initial B, which stands upon the baseline of the first line of script and rises firmly into the upper margin. 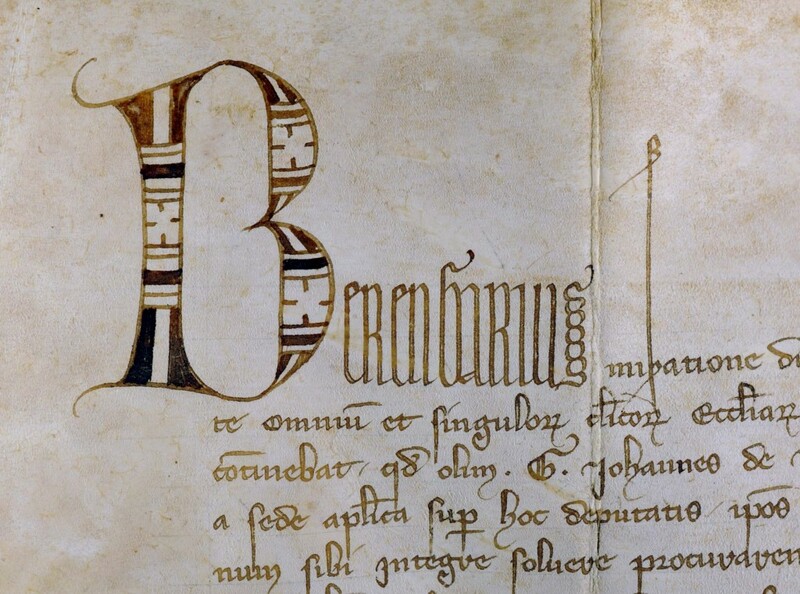 The other letters of the name Berengarius ascend as a clustered, narrow group, before the document settles into the main script, which provides an upright, neatly written Gothic Textualis, with some curved, hook-like tips ascending or descending into the interlines. Although the lettering, which employs some abbreviations, is, for the most part, clearly decipherable, the sense of the phrasing overall proves a puzzle. Panorama view of the historical district of Calahorra. Photograph: Own Work by De Zarateman via Creative Commons. 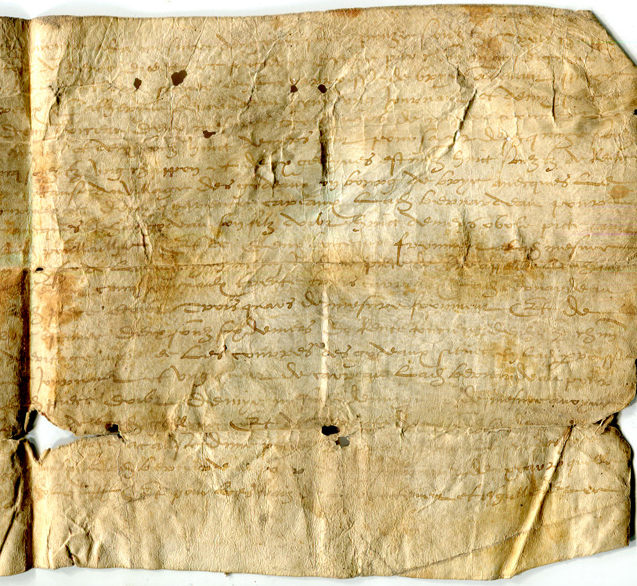 The letter declares its issue during the reign of Pope John XXII (1244–1334), the second Avignon Pope (reigned 1316–1334). 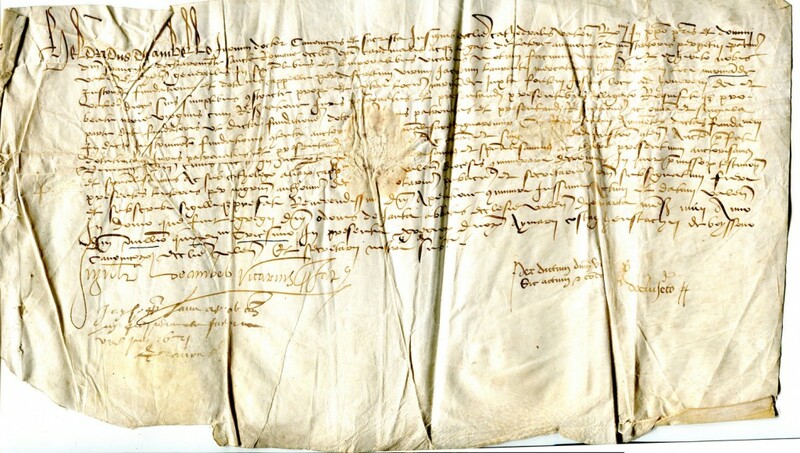 The issue of the letter relates to the span of “political and administrative correspondence of the Avignon popes, 1305–1378”, as surveyed, for example, by Patrick Zutschi in a paper presented in 1988 (published in 1990). As such, it would hold interest as a relic of that contested period in the papacy. We plan to write some more about this questionable document, but other tasks and challenges (including illnesses and a death in the family) have interfered with the completion of the report. Returning somewhat to health, I decided that it might be useful to send forth these observations, questions, and images, to set the discussion going. Do you have any views on this matter and material? Please let us know. Meanwhile, feast your eyes on its features. Photography by Mildred Budny. More to come. Please watch this space.